Tomb Raider II, also known as Tomb Raider – Secret of the Sword was released following the great success of the first game, Tomb Raider. The game gives Microgaming players another chance to company the famous Lara Croft in her adventures. This time, they have one set and clear goal, which is unveiling the secret of the sword. This is why the game is named after that quest and there is also bonus round where players will travel the world to reveal the secret of the sword. Play Tomb Raider 2 Slot here. Speaking of the bonus round, it is triggered when the passport symbol lands on the middle position of any of the reels. This will trigger the Global Adventured Bonus where players will be taken to a second bonus screen where they will pick spots on a map to go to in order to earn cash prizes and collect pieces of the sword’s secret. Once they collect them all and unveil the secret of the sword successfully, they will get paid handsomely. 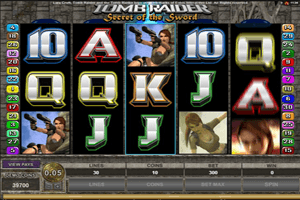 The slot machine also comes with a wild symbol, the Tomb Raider symbol and a scatter symbol that triggers free spins, the mysterious green object symbol. Add to that the regular line payouts that are formed on the activated paylines. All of this shows how rewarding the game can be.